I recently put together a quad core system from parts my brother was retiring from his home system. Soon after getting everything up and running, the new system would sometimes hard hang while working via VPN. A hard hang is when the OS becomes completely unresponsive but is still running. I had earlier prepared myself for the next instance of this encounter by enabling CrashOnCtrlScroll in the Windows registry so that the next time it happened I could manually crash the system from the keyboard and examine the memory dump with WinDbg for signs of the responsible culprit. You can read about how to enable this option in this earlier blog Forcing a System Crash on an Unresponsive PC. Upon opening a kernel dump, the analyze –v command is a clickable hyperlink1. 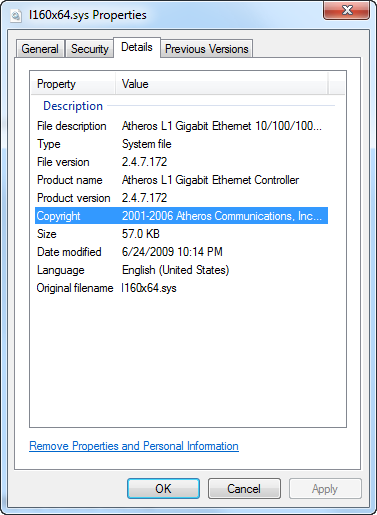 Yep, 3rd party Ethernet driver, which I was already suspicious of since the hang would only happen when I was using VPN. The other processor stacks only reveal MS kernel mode drivers or processor drivers, further isolating the cause of the hard hang to this vendor’s driver. The next course of action is to download an updated set of Ethernet drivers for this device. 2 Processor are numbered starting at 0, so Processor 2 is actually the third core. To quickly see how many cores there are, use the !cpuinfo command. This entry was posted on May 7, 2012 at 10:39 pm	and is filed under Troubleshooting. Tagged: Crash, Dump, Hang, WinDbg. You can follow any responses to this entry through the RSS 2.0 feed. You can leave a response, or trackback from your own site.